Decorative edge scissors may not be as popular as they were ten years ago, but they're still a worthwhile addition to your stash of scrapbooking tools. 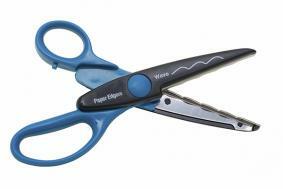 These inexpensive scissors are useful for making borders, photo mats, and page embellishments. 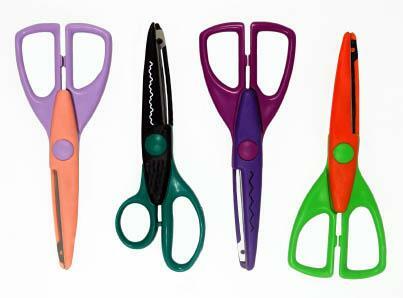 You can purchase decorative scissors individually or in coordinating sets that include several matching patterns. 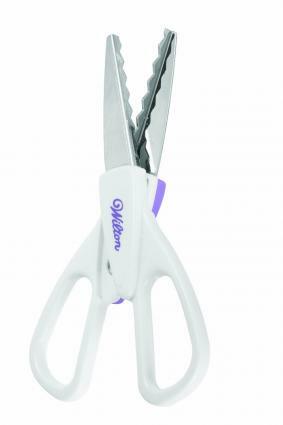 It is generally more cost-effective to buy scissors in a set, however. Zig Zag: This pattern is a simple series of equally spaced triangles. These are sometimes called Pinking. Scallop: A Scallop pattern is a series of neatly aligned half circles. Deckle: The Deckle pattern is intended to mimic the look of torn paper. Wave: The Wave pattern looks like the waves in an ocean. This pattern is sometimes called Ribbons. Victorian: The Victorian pattern looks somewhat like lace. It is most often used for heritage scrapbooking projects. Fiskars is known for making high quality paper crafting tools. The company offers a set of six Contemporary Edgers which are easily identified by their handles. EK Tools has a four-scissor set that is perfect for the beginning scrapbooker who just wants basic patterns. 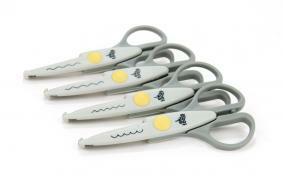 This set includes Wave, Deckle, Zig Zag, and Scallop scissors with an ergonomic design. These are suitable for both right and left handed crafters. X-ACTO has a four-scissor set with Zig Zag, Short Wave, Victorian, and Tiara patterns. The blades are made from stainless steel and the handles contain 20% post-industrial recycled plastic. Paper Shapers decorative scissors come in an attractive solid oak storage caddy. This 12-scissor set includes classic patterns like Deckle, Bell, Bubbles, and Large Pinking as well as more unusual designs like Bat Wings, Imperial, Cracker, and Arabian. If you have patterned paper that you like but the design is too busy for a background, cut it into squares. Then, arrange the squares into a simple grid on a plain cardstock background. Cut along the edge of your paper with scalloped scissors, then add tiny buttons or brads in each scallop for a memorable looking page border. Trim a white photo mat with stamp scissors to turn your focal point photo into a faux postage stamp. Add interest to a simple journaling block by trimming just the bottom edge of the paper. If you're making a scrapbook layout that includes a pocket for memorabilia, trim the top of the pocket with these scissors. Use pinking scissors along the edge of your papers when you don't have time to break out the sewing machine. Cut small paper triangles to make your own decorative photo corners. Make faux ribbon or rick-rack by cutting thin strips of paper. Cut several strips of various shades of blue cardstock with wave patterned scissors to make a unique background for a beach or ocean themed layout. Use lace or Victorian themed scissors to cut strips of coordinating patterned papers into a border for a heritage layout. Use decorative edge scissors to make a comb for texture paste. Cut a strip of sturdy cardboard, then drag it through the paste to make an interesting pattern on your cardstock. Never cut original photos. If you want to experiment with cutting photos, use copies. Limit yourself to using one or two scissor patterns per page. When it comes to this technique, it's easy to overdo it. Try to choose patterns that fit well with the theme of your page. Don't use lacy or flowery patterns on a boy's layout, for example. Be patient. When using decorative scissors, you need to line up the blade after each cut in order to avoid a break in the pattern. This means you can't cut as fast as you would with regular scissors. Practice cutting on scrap paper first if you're having trouble getting the pattern to line up correctly. scrapbooking, like most other craft-related pursuits, tends to have various trends in what tools and supplies are most popular. Many people today shy away from using decorative scissors because they associate them with the style of scrapbooking that was popular throughout the 1990s. Others think decorative scissors are unnecessary given the widespread availability of paper punches and die cutting machines. If you enjoy using decorative scissors on your layouts, don't let fears about not being a "trendy" scrapbooker keep you from expressing your creativity. The key to success in scrapbooking is to create pages that you enjoy. As long as you're happy with the end result, it doesn't matter if you're following current trends or coming up with a style that's all your own.